Are you ready for the return of Brooklyn Nine-Nine? Star Terry Crews just revealed season six is coming to NBC in January. The comedy series was recently revived by NBC after being cancelled by FOX. The cast includes Andy Samberg, Andre Braugher, Terry Crews, Chelsea Peretti, Melissa Fumero, Joe Lo Truglio, Stephanie Beatriz, Joel McKinnon Miller, and Dirk Blocker. What do you think? Are you a fan of Brooklyn Nine-Nine? Are you looking forward to season six? 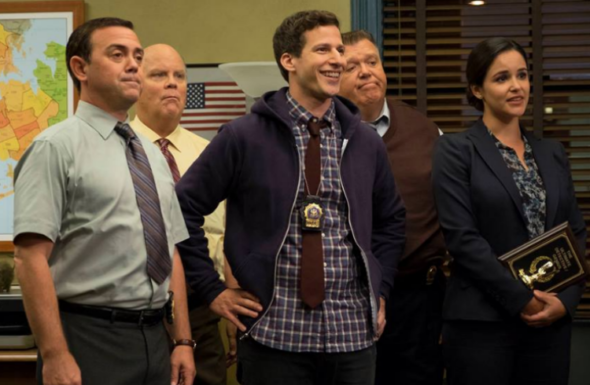 More about: Brooklyn Nine-Nine, Brooklyn Nine-Nine: canceled or renewed?, NBC TV shows: canceled or renewed? Bingpot! Im so glad we might get 1 or more seasons as I feel the show has always been great but only after so much story has the characters and show as a whole, just started hitting its stride. Hell YEAH!!!!! BEST SHOW EVER!!!!!! So so psyched it’s coming back!!!!!!! Noice! Toight!! !